Daewoo Engineering & Construction Company (Daewoo E&C), one of Korea’s leading construction companies with a growing presence in Middle East and Africa, said it has successfully completed a $200-million dual tranche (conventional and Islamic) syndicated term facility. Emirates NBD’s investment banking arm, Emirates NBD Capital (Emcap) acted as sole mandated lead arranger and bookrunner for the transaction that included eight other regional and international banks. The transaction marks Emcap’s debut syndication for a Korean corporate, which attracted a wide base of investors across the GCC, Europe and Asia, said a statement from Daewoo E&C. The transaction was initially launched at $100 million, which got oversubscribed by two times and was eventually upsized to $200 million; a testament to Daewoo’s growing global reputation stemming from its strong commercial competitiveness and extensive technical expertise, it stated. 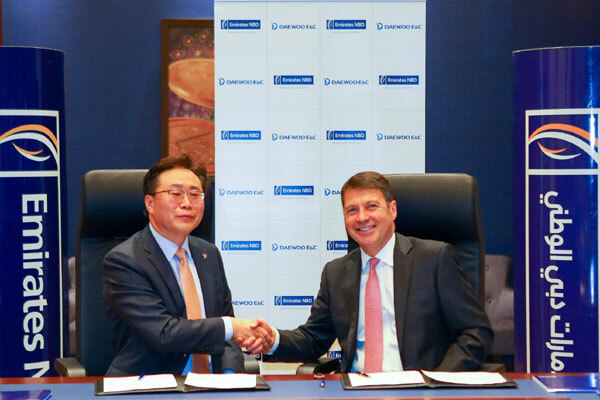 Daewoo E&C Executive VP Inhwan Cho said: "This facility is part of our company’s conscious strategy to proactively tap new liquidity, especially in the GCC financial markets which will potentially auger well for future financing requirements in relation to our Middle East projects." While Daewoo E&C has tapped global syndicated loan markets in the past, this transaction is of strategic importance to the company, since it has allowed them to forge key relationships with Islamic banks based in the Middle East that are active in the contracting space, he stated. According to him, the facility is structured as a two-year bullet funding comprising both Conventional and Murabaha tranches and will be utilised towards funding working capital requirements for the company’s overseas projects. Ahli United Bank (DIFC Branch); Ahli United Bank KSCP and Warba Bank KSCP acted as the mandated lead arrangers, while Kuwait International Bank KSCP and Bank SinoPac Offshore Banking Branch acted as the lead arrangers for the transaction. The banks which acted as arrangers included Credit Europe Bank NV; Mashreqbank and the First Commercial Bank Offshore Banking Branch. Emcap CEO Fahad Abdulqader Al Qassim said: "The overwhelming success of this deal reaffirms our market position in the region as the “go-to” bank for international clients looking to tap Middle Eastern liquidity, in addition to global appetite."